River Taw Farms is home to a closed herd of over 325 cows in our cow / calf operation. About two thirds of our herd are Registered Black Angus and the rest are commercial cattle where we are crossing the Angus cows with Hereford bulls. We sourced the majority of our registered cattle from Yon Family Farms in Ridge Spring, SC and Primus Genetics in Millers Creek, NC. Most of our 15 registered bulls came from Yon Family Farms with EPDs at the very top of the US Angus herd. We have selected these bulls for Calving Ease, Birth Weight, Weaning, Yearling, Milk, Marbling, Ribeye, $W and $Beef. Our animals have a good thick appearance, sound feet and quiet dispositions. We also acquired one third of our heifers from the Yon Family. Primus Genetics had selected cattle from some of the leading Angus herds in the United States such as Stevenson-Basin Angus, Beartooth Angus, Express Ranches, Gardiner Angus Ranch and Wehrmann Angus. At their total dispersal sale in November 2008 we selected a diverse group of 68 heifers with traits designed to optimize feed conversion and growth. Our cattle receive a forage diet free of herbicides and pesticides. They are continually rotated to fresh new pastures. Our animals are never held in confinement, never fed antibiotics and never receive synthetic growth hormones. We want to allow them to live the lowest stress and most natural, healthy existence we can. We plant annual drought resistant grasses (including Millet & Teff) and save both hay and silage for winter forage. We have acquired all of the equipment necessary to support no-till farming and grass harvesting (mostly John Deere). Black Angus are resistant to harsh weather, undemanding, adaptable, good natured, mature early and have a high carcass yield with nicely marbled meat. Angus are renowned as a carcass breed. They are used widely in crossbreeding to improve carcass quality and milking ability. Angus females calve easily and have good calf rearing ability. They are also used as a genetic de-horner as the polled gene is passed on as a dominant characteristic. The breed arose in north-east Scotland in the counties of Aberdeen and Angus. Excavations have revealed that polled cattle existed there in prehistoric times. Deliberate breeding began at the end of the eighteenth century. The breed was first formally recognized in 1835 with the first herd book published in 1862. When two of the George Grant bulls were exhibited in the fall of 1873 at the Kansas City (Missouri) Livestock Exposition, they were met with some skepticism because of their polled (naturally hornless) heads and solid black color (Shorthorns were then the dominant US breed.) Grant, a forward thinker, crossed the bulls with native Texas longhorn cows, producing a large number of hornless black calves that survived well on the winter range. The Angus crosses wintered better and weighed more the next spring, the first demonstration of the breed's value in their new homeland. The American Aberdeen-Angus Breeders' Association (name shortened in the 1950s to American Angus Association) was founded in Chicago, Illinois, on November 21 1883, with 60 members. The growth of the Association has paralleled the success of the Angus breed in America. River Taw Farms has successfully used the support and resources of the American Angus Association to build a healthy, genetically diverse herd of Angus cattle. 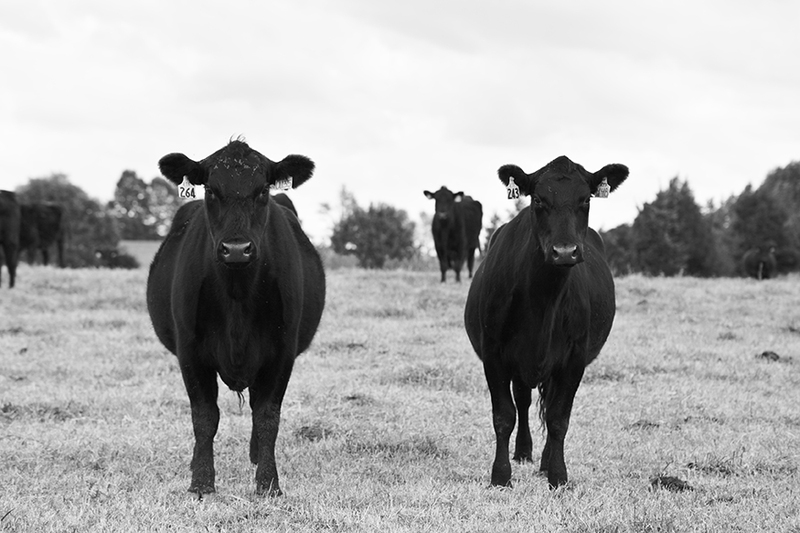 For more information on our Black Angus cattle, please contact us.